Cape Canaveral, Fla. (AP) – The Trump administration wants NASA out of the International Space Station by 2025, and private businesses running the place instead. Under President Donald Trump’s 2019 proposed budget released Monday, U.S. government funding for the space station would end by 2025. The government would set aside $150 million to encourage commercial development and use future savings to aim for the moon. Many space experts and legislators are expressing concern. Sen. Bill Nelson, a Florida Democrat who rocketed into orbit in 1986, said “turning off the lights and walking away from our sole outpost in space” makes no sense. Retired NASA historian and Smithsonian curator Roger Launius notes that any such move will affect all the other countries involved in the space station; Russia is a major player, as is Europe, Japan and Canada. NASA has spent close to $100 billion on the orbiting outpost since the 1990s. The first piece was launched in 1998, and the complex was essentially completed with the retirement of NASA’s space shuttles in 2011. MIT astronautics professor Dava Newman, who was the deputy NASA chief under Barack Obama, called the space station “the cornerstone of space exploration today” but said the Trump administration’s proposal makes sense because it is doing long-term planning. The president proposes shifting large chunks of money from the space station, satellites studying a warming Earth and a major space telescope toward a multi-year $10.4 billion exploration plan aimed at returning astronauts to the moon in about five or six years. “We’re building capability for the eventual human exploration of deep space and the moon is a stepping stone,” NASA’s acting chief financial officer Andrew Hunter said in a Monday news conference. The president’s budget proposal, including NASA’s portion, was obsolete even before it was made public, but it provides a view into the administration’s priorities. Congress earlier this month passed a spending package that set limits through the end of the next budget year. And for the second straight year, the Trump administration proposes killing five missions that study Earth, especially its climate and the effects of carbon dioxide. The president also plans to end education programs in the space agency. 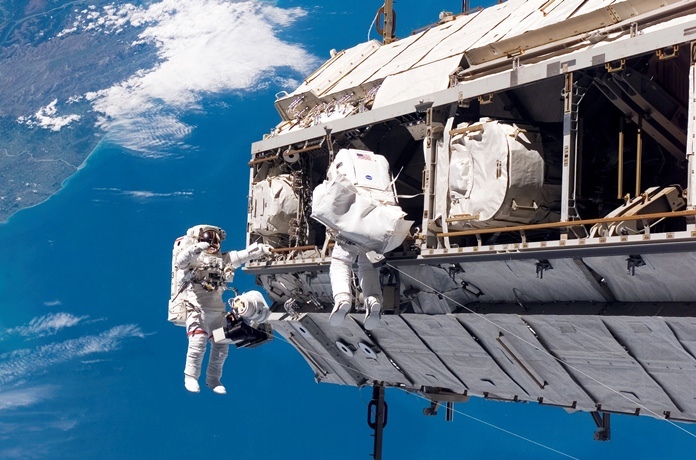 Private businesses already have a hand in the space station project. The end of the shuttle program prompted NASA to turn over supply runs to the commercial sector. SpaceX and Orbital ATK have been making deliveries since 2012, and Sierra Nevada Corp. will begin making shipments with its crew-less mini shuttles in a few years. SpaceX and Boeing, meanwhile, are developing crew capsules to fly astronauts to and from the space station within the next year. These commercial flights will represent the first astronaut launches from U.S. soil since NASA’s shuttles stopped flying. A complete transfer to the commercial sector is a different matter, however. Mike Suffredini, a former space station program manager for NASA who now runs Axiom Space in Houston and aims to establish the world’s first commercial space station cautioned that the U.S. government needs to have a direct hand in the International Space Station until it comes down. No company would accept the liabilities and risks associated with the station, he said, if the sprawling complex went out of control and came crashing down. His company’s plan is to attach its own compartments to the existing International Space Station and, once the decision is made to dismantle the complex, detach its segment and continue orbiting on its own. Altogether, the administration’s proposed budget, along with an addendum, seeks to increase NASA’s budget slightly to $19.9 billion. While the budget plan said it places renewed support on returning humans to the moon, followed by human expeditions to Mars and elsewhere, no precise timeline and few details are provided. The supersize Space Launch System rocket being built by NASA to send astronauts beyond low-Earth orbit – along with its Orion crew capsule – would get $3.7 billion under this budget. A test launch of this system would remain on track for 2020, with a first crewed launch around the moon three years later, according to budget details. In an agency-wide address, NASA’s acting administrator Robert Lightfoot said it was a “very exciting” budget with lots of potential, despite some hard decisions. Among them: the proposed end of WFIRST, a telescope with 100 times the field of view of the Hubble Space Telescope. WFIRST was a mission that the National Academies of Science listed as the decade’s No. 1 priority for future NASA astrophysics missions. The WFIRST telescope’s cost estimates have ballooned to $3.6 billion and Hunter said it just got too expensive.